For the first time, the hairstyle of the Roman Vestal Virgins has been recreated on a modern head. The Vestals were priestesses who guarded the fire of Vesta, the goddess of the hearth, among other sacred tasks. Chosen before puberty and sworn to celibacy, they were free from many of the social rules that limited women in the Roman era. Their braided hairstyle, the sini crenes, symbolized chastity and was known in ancient texts as the oldest hairstyle in Rome. 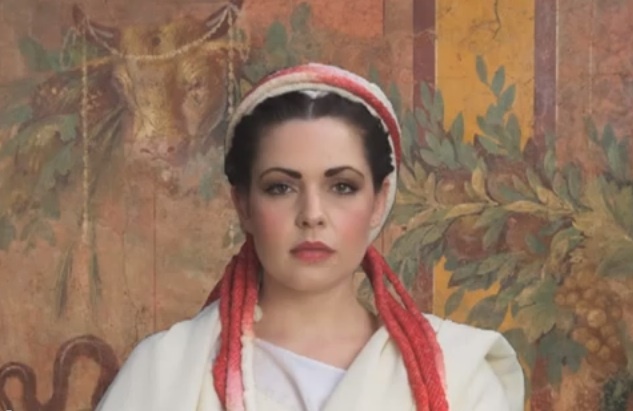 "These were the six most important women in Rome with the possible exception of the emperor's wife," said Janet Stephens, the Baltimore hairdresser and amateur archaeologist who unraveled the secrets of the Vestals' trademark braids. Stephens reported her findings Friday (Jan. 4) at the annual meeting of the Archaeological Institute of America in Seattle. She first became interested in ancient hairdressing after what she calls an "accidental encounter" with an ancient portrait bust in Baltimore's Walters Art Museum. "I said, 'Oh, that is so cool, I gotta try this at home,'" Stephens told LiveScience. "And it failed miserably." The failure spawned seven years of research and a publication in the journal Roman Archaeology on the techniques of Roman Imperial Period hairdressing. The Vestal Virgin style, however, presented particular challenges because the Vestals' layered headdresses covered much of their hair. In sculptures and other artwork, the details of the Vestals' braids are often obscured. "It's been incredibly elusive trying to figure out how it was made until now, because there were only two artifacts that show the hairstyle in enough detail to tell anything about how the hairstyle was constructed," Stephens said. Using those two artifacts — busts of vestal virgins — Stephens tracked the braids from where each must have originated on the head. The lines of the braids reveal how they were made, she said. "It's like weaving. Every weaving pattern shows its marks," Stephens said. 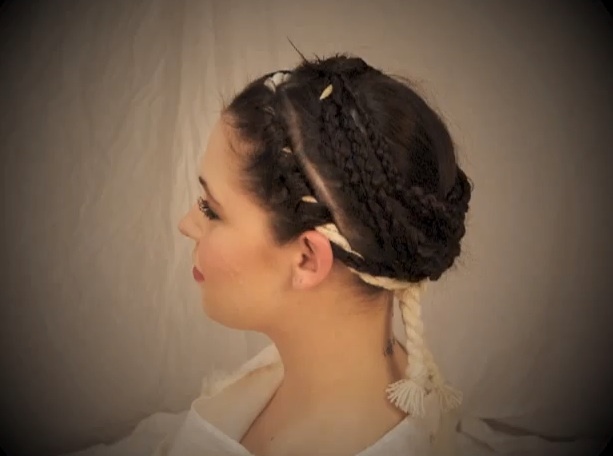 First, Stephens found, the Vestal's hair would be separated into sections, each of which would be braided into six separate braids, including a pair of cornrow braids that ran flat across the head above the ears. The hair around the hairline would then be wrapped around a cord, which would then be tied at the nape of the neck. Leftover loose hair from around the face would then be weaved into a final, seventh braid. Next, the first six braids would be brought around the back of the head and tied in pairs in half square knots. The ends of the braids would then be wrapped up to the front of the head and secured to the cornrow braids above the ears. Then, the seventh braid would have been tucked up and coiled at the back of the head underneath the knotted braids. Working alone on a live model with only tools ancient Romans would have had, the process takes about 35 to 40 minutes, Stephens said. Vestal Virgins, however, would likely have had slaves to dress their hair. With two or more people doing the braiding, the hairstyle could have come together in less than 10 minutes, she said. The Vestal hairstyle requires about waist-length hair to pull off, Stephens said. (Other ancient styles recreated by Stephens are friendlier for short hair.) However, Vestals were chosen for the priesthood between the ages of 6 and 10, before their full adult hair lengths would be known. Thyroid problems and many other hair-loss conditions don't show up until after puberty, Stephens said. "I'm sure they had to make some workarounds occasionally for a Vestal who had less-than-adequate hair," she said.